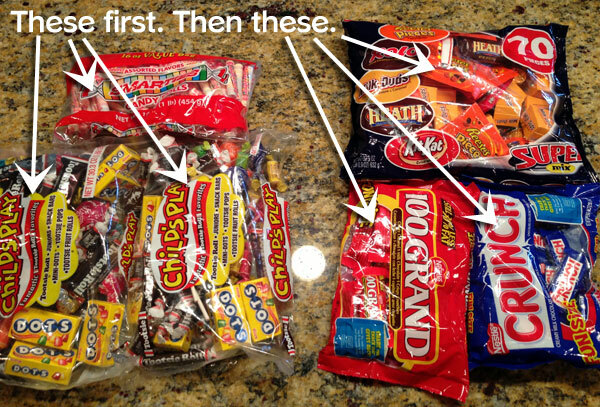 I’m sure you have a strategy that’s similar to ours when it comes to handing out Halloween candy. Every year we buy some good chocolate candy, like Reese’s and Kit Kats and Nestle Crunch and things like that. And then we also buy a couple bags of … y’know … less good candy, like Smarties and lollipops and Dots and things like that. And when Halloween comes around, it’s the less good candy that gets handed out first, right? That’s how everyone does it, don’t they? Because, you know, if you end up not giving out all your candy, which do you want to have to eat yourself for the next week? You want to eat the good stuff — Kit Kats and Reese’s. As you can see, we’re ready for next week. Here’s what we’ll be giving away. Since this is our first Halloween in the new neighborhood — which is far less populated than our old neighborhood, not to mention way out away from the high-traffic parts of town — we have no idea how many trick-or-treaters to expect. I’m guessing it’s going to be a lot less than at the old house, so we may have a lot of candy leftover. In any case, the lesson here for local kids is to knock on our door later in the evening when the good candy is the only thing we have left. Or just skip our house altogether so we can enjoy the Reese’s ourselves. Up to you. Happy Halloween!